So, I’ve got a little catching up to do now, and multiple things to post about. The week before last, I intended to play through Bugdom (or as much of it as I could get through, anyway) and post about that, and obviously that didn’t happen. 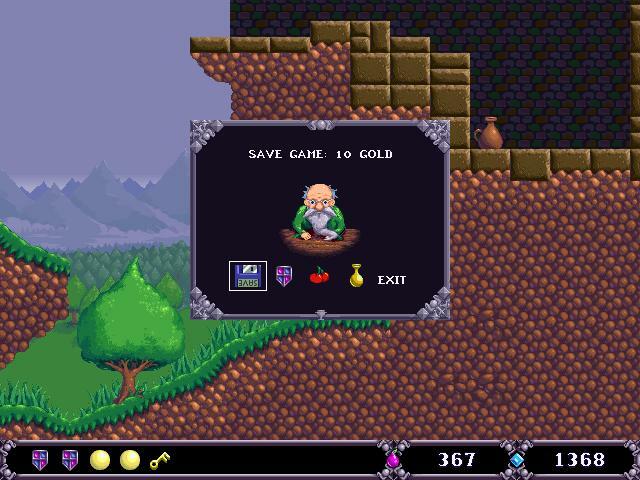 What happened instead is that GOG made a retro metroidvania-style platformer called Treasure Adventure Game available for free, and I found it so compelling that I wound up spending most of my gaming time for the week on that instead. Like VVVVVV, TAG is something of a love letter to a particular era of gaming — in this case, the SNES era. Beyond the pixel art and chiptunes, it’s got such Nintendoisms as the kid hero whose mother-figure sees him off on his journey, dialog where you don’t hear the player character’s side, sudden discrete shifts in terrain type (including a small desert with quicksand pits), and an inventory screen with silhouettes of the items you haven’t collected yet. 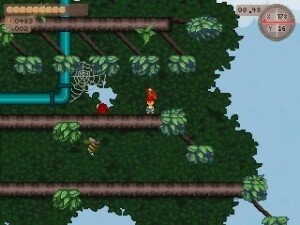 I suppose it’s de rigeur these days for indie platformers to reference the games that their developers played as children, but that isn’t really what’s going on here; only in the final boss fight does it reference anything directly, using sprites ripped straight from Mario and Castlevania and a couple of others. When this happens, it comes as a bit of a shock, because up to that point the game has been carefully building its own world — one that works by familiar rules, but has its own history and even its own implied continuity with other, nonexistent games: the overarching goal for most of the game is to collect twelve treasures used by a previous legendary hero in his quest, which we’re told were gathered together again by an archeologist and then lost again a few years before the adventure begins. You can’t use these treasures yourself, as their magic faded long ago, but they’re described as exactly the sort of thing you’d find in a videogame. For example, there’s a “Chaos Whistle” that “would confuse enemies, causing them to attack their allies”, and an “Echo Mirror”, “used as a shield to reflect spells cast at him back at the attacker”. Rather pointedly, the player character collects twelve tools of his own over the course of the game, albeit for the most part humbler and more prosaic ones, such as a shovel and a flashlight. Things that a young boy who goes exploring might find useful. Because that’s the one of the main themes here: not just exploring, but a Nintendoized version of the kind of exploring found in stories for boys. There’s buried treasure to dig up, dirt tunnels to crawl through, a secret laboratory in the forbidden tunnels underneath an office building. There are also talking bugs and a variety of silly hats to wear, some of which actually have effects on gameplay. It’s very much a childhood fantasy of a game, by which I mean not just that the content is like a child’s fantasy (of having freedom and power, of having meaningful things to do in the world — in short, a fantasy of adulthood), but that it’s the sort of game that we wanted games to be when we were children, but which the actual games of the time fell short of. But the nostalgia factor means that it’s not really pitched at children, so it’s more like a memory of a fantasy, or a fantasy of being young to have a fantasy like this one. Mind you, there are things here that no official Nintendo game would include. I refer specifically to the drug references. OK, yes, Mario does magic mushrooms. Ha ha. Well, that which you could read into Mario is downright explicit here. There’s a cave realm inhabited by mushroom people who talk like stoners, who are described as “junkies” by your parrot sidekick, and some of whom are hallucinogenic: touch them, and the screen warps alarmingly, while platforms that you couldn’t see or stand on before appear, allowing you to, well, get higher. I don’t want to make it sound like this a game about drugs overall, though. This is just one section in a large game, and elsewhere, the only things hinting at drugs are occasional bongs in the background in the pawn shops and junk stores found in most of the game’s towns. Now, I call it a “large game”, but I managed to finish it in less than a week. It may not be large in an objective sense. But it does a very good job of seeming large. Partly I think this is due to the due to the amount and variety of background detail, like the aforementioned bongs. True, it’s all coarsely pixelated, but this in fact helps: the backgrounds are made of the same sorts of sprites as the foreground, which means that anything could be interactive until you try and fail to interact with it. Even when you can’t interact with stuff, very often the NPCs do. This gives it a sort of Little Computer People vibe, as if there really is a simple, pixelated world going on unrelated to your platforming heroics. And the sense of world is reinforced by the fact that it’s contiguous: everything outdoors exists in a single space. Interiors break this consistency — buildings tend to be larger on the inside — but the world as a whole is one big platforming space, not even divided up into screens, composed of multiple islands that you sail between in real time, without exiting to a world map or anything of the sort. (There is a shortcut to travel, but you can’t access it until you’ve been most of the way around the world the hard way.) Late in the game, you acquire a diving helmet that lets you explore the depths between the islands, where there’s sunken treasure to be found. The interesting spots underwater are sparse, but the underwater is still a consistent, contiguous world, with as much ocean floor as there is ocean surface, and that helps the sense of scale. Now, about that boat. Boats are seldom a good idea in games, in my opinion. I particularly dislike them in strategy games like Civilization and Empire; they’re probably part of the reason I haven’t finished the Plane of Water level in Heroes Chronicles: Masters of the Elements yet. In such games, you usually have to build the boat, using up resources in the process, then gather your units and go through a special boarding step, and then very often your units can’t use their normal actions, and the whole thing is vulnerable to sinking. Even in a platformer, a boat typically means learning a distinct and less-capable control system. The point is that, although boats in games are in theory a convenience, letting you cross otherwise-uncrossable bodies of water, they’re typically experienced as an inconvenience. Well, the boat in TAG is about as convenient as a boat can be. Supposedly, it uses advanced technology to shrink down and fit in your pocket when not in use. The effect in the game is that when you jump into the water, be it the ocean or a pool in a cave, the boat appears automatically, and when you jump back onto land, it goes back in your pocket. It does prevent you from attacking normally, but once you’ve upgraded it with a cannon, it more than makes up for it. There are even places where you deliberately jump into the water just so you can use the cannon. I do have a couple of complaints. The default key bindings are weird; fortunately, it’s a simple matter to rebind them. (The game seems to want to be played from a gamepad with four face buttons. I played with arrow keys and WASD instead.) There’s a strange business with (non-hallucinogenic) mushrooms throughout the world: there are bouncy mushrooms you can trampoline on, but in some places they start off too small to be used this way, and only grow to maturity after you’ve reached the place they allow access to by some other route. In other words, they become a shortcut for return visits. The problem is that the immature form looks too much like the mature form. It’s quite frustrating, early in the game, to learn that pink speckled mushrooms can be jumped on, then unexpectedly not have it work. This is more like what I described with boats in other games: a convenience that’s experienced as an inconvenience. Overall, though, this is a really good game, and I suggest you try it if you haven’t already — it is free, after all. It’s particularly good at reusing locations, making the meaning of a particular island or dungeon room change as you gain new tools and can approach it in different ways. And that’s metroidvania in a nutshell, really. When I was trying to google for information on how many levels Jarsper’s Journeys contains, one of the false leads I kept turning up was a review that talked about having difficulty with the final boss. The person who wrote it wanted to buy a triple-shot potion from the inn to make it easier, but found to his dismay that he was just a few coins short of being able to afford it. If I wasn’t already hoarding my coins, this sad story would have convinced me to start. However, my experience turned out completely different: by the end, I had thousands of coins and nothing to spend them on. It was as pure an example of the hoarding problem as you could hope to witness. In the earliest levels, I was reluctant to buy potions because they were expensive and I didn’t know if I’d need the cash later. I did start buying stuff toward the end, but the fact is, the game never really gets all that hard. Particularly if you’re exploring: many of the tougher fights can be skipped if you find the right secret passages. I can’t say I got every treasure in the game, because there are places where this is just plain impossible. Sometimes you have a choice of path from A to B, and you can’t go back to get the treasures on both paths. This doesn’t happen often, but it does happen. Also, there’s a significant amount of cash emitted by slain monsters, little golden coins and stars that bounce away in random directions and then vanish, like rings in Sonic the Hedgehog. It’s rare that I manage to get all the coins from even a middling enemy. When you kill a boss, it explodes into a cascade of coins, and there’s no way you can get them all before they disappear. All you can do is try to be in the thickest part of the storm. Not every level has a boss, by the way. Maybe half do, and a couple of them are among those tough-but-skippable fights I mentioned. The first couple of bosses, the anthropomorphic Armored Pig and the Fire-Breathing Ogre, show up as non-bosses in later levels, which is a little strange, because usually when that happens in games, it’s a sign of your escalating power, and there’s no escalation of power here. There’s just escalation of difficulty. You do get increased firepower from a couple of potions, but it only lasts to the end of the level. Of course, you get the opportunity for maximal firepower when facing the end boss, which means not just the aforementioned triple-shot, but the butterfly as well. The butterfly is like the drones or multiples in various spaceship-themed shooters: it floats above your head (sometimes lagging behind you a little) and shoots along with you. Not only does this increase the area covered by your shots, there are places where it lets you shoot from positions of complete safety, hitting a monster on the floor above you. The end boss is of course the witch who stole your cat, who flies around on a broomstick, forcing you to keep jumping to shoot at her. She’s very much in the classical vein for a shooter boss, with multiple attack routines that saturate the screen with projectiles of various sorts: expanding rings of magic missiles, curving clusters of fireballs, bubbles that release frogs or bats. All of these missiles can be destroyed with your own shots, and you pretty much have to take advantage of this just to carve out a safe place to stand. More firepower will be expended on neutralizing danger than will actually hit the witch, particularly since the witch tends to vanish briefly whenever a shot connects. Anyway, it was nice getting a fight with some variety in it, because all of the prior bosses were relatively simple in their behavior, with only one attack routine each. Overall, the game is faux SNES-era in both its graphics and its moment-to-moment gameplay, but it gives me an impression that it’s probably better than most of the games it imitates — that it’s designed to capture the way we like to remember platformers of that vintage, rather than the way they actually were. I’m up to the middle of level 10 out of what turns out to be 15. I had thought for a while that there were only 10 levels, because I was having trouble finding any definite information online, and the closest thing I had seen to a walkthrough was some hints that only went up to level 9. But 15 is the truth, according to the game’s official website. Feeling like I was close to the end motivated me to keep going; suddenly finding out that I’m farther than I thought motivates me to play something else for a little while. It’s actually a bit of a relief to be able to devote multiple posts to a game right after the IF Comp, where I felt like I had to summarize everything interesting about each game in a single post. So let me just note a couple more points of interest about Jasper’s Journeys. Like the music. It’s very synthetic sounding, in a faux-Soundblaster way, but the interesting thing is in how sparingly it’s used. This actually seems to be a constant throughout the Lexaloffle games: there’s no music most of the time. So when it does come up, you know something special is happening. The opening menu has a sort of wonder-and-mystery theme behind it, which is sometimes triggered in the game when you venture into a hidden passage. Some particular types of monsters have their own leitmotifs. 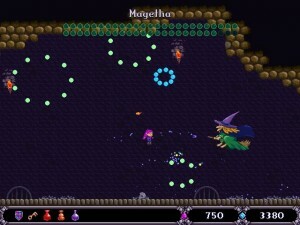 For example, wizards, which are the first abnormally-difficult enemy you encounter, taking four hits to kill and throwing magic missiles that home in on you, have an echoey wizard tune — at least, until you reach the point where wizards no longer seem special, at which point the leitmotif is dropped. Another, unrelated point of interest: missile trajectory. You can fire projectiles left and right, and there are a few enemies that can do the same. Surprisingly, such missiles fall. There’s a trick I’ve seen used a couple of times wherein a frangible block is placed on the floor. Since you can’t shoot straight downward, the only way to break it and open up whatever passageway it blocks is to stand at a sufficient distance (about five tiles) that your shots will hit the ground at that spot. Another constant throughout the levels is “sproing flowers” (as the in-game docs name them): blue flowers that propel you upward at speed when you jump on them. They also have the same effect on downward-moving projectiles. I have yet to see a puzzle that relies on this, but it seems like the sort of thing this game would do. If there’s one game element that defines the Jasper’s Journeys experience more than any other, it’s got to be the inns. 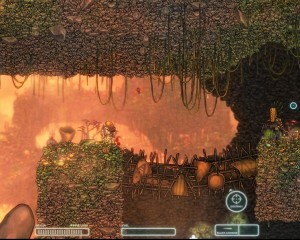 Every level has at least one, although it might be difficult to find or reach. At the inns, you can exchange all the treasure you’ve been accumulating for practical stuff, like fruit (increases your ammo supply) or shields (effectively, hit points; you can carry up to three, which means you’ll be able to withstand damage three times without dying), or even, occasionally, potions. 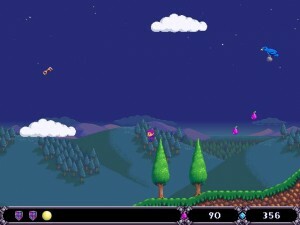 Potions are powerups of various sorts that last for the rest of the level, and are sometimes absolutely necessary for looting the level completely. They’re reasonably rare. Most importantly, inns are where you can save your progress. Yes, it’s a save point, that console-standard mechanism despised by PC gamers everywhere. Worse, even: like everything else you can do at an inn, it costs money. Not a lot of money, mind you. A save is the cheapest thing you can buy, and if you’re exploring every level thoroughly, you’re rolling in cash pretty quickly. (If you’re not, you’re pretty much missing the point of the game.) Nonetheless, the fact that it costs money at all makes me reluctant to use it more than necessary. It’s irrational, perhaps, but it’s a real and honest reaction. Now, when I say that you can save your progress, understand that, despite its retro styling, this game is not so old-school as to respawn its monsters. If you kill something, it stays dead, and you can venture through the area it used to guard in relative safety. Given this, I think the inns actually have an overall positive effect on the experience. If you could save at will, you could make things easier by saving after each and every kill. If you could save any time you went back to the inn, but didn’t have to pay, you could do the same thing, just stretched out over a longer period and made boring because of it. But the way it is, the game essentially spurs me to complete some more significant activity before saving. Make a complete loop of a particular cave, for example, or go as far upward as I can through the clouds (which are solid enough to stand on). The inn becomes your home base, the safe place that you always return to for the sake of securing your gains, which is important, because the tasks I perform before returning are risky. Risky enough that I frequently fail and have to start over — for some definition of “fail”. Sometimes I start over just because I lost more health than I wanted to. At any rate, this cycle is essentially the same as the way you’d play the game if the inns didn’t exist: every time you die, you’d wind up at the start of the level and have to start again. The difference is that, for the most part, you get to choose just how granular it is, how much you want to not have to redo. I’m rather behind on my posting here, which interferes with my playing: I’m sworn to post per day for each game I play, which means that if I play a game and don’t post, I can’t play it again until I’ve posted. Usually this means I just don’t play anything from the Stack until I’ve written something, but something inspired me to play the three Lexaloffle mini-games I acquired from the most recent Humble Bundle in a row, one per day. I haven’t finished any of them, so let this be the introductory post for all three. The first one I tried was Zen Puzzle Garden. The goal here is to rake every grid-square of sand in a series of rock gardens, starting each stroke from the edge and using traditional videogame ice level movement mechanics, which is to say, you can’t change direction until you hit an obstacle, such as a rock or a tile you’ve already raked. I’ve completed somewhat over half the puzzles here, but the half I’ve completed is the easy half. It lets you play the puzzles in any order you want, choosing them from a grid between times, but if you play them in order, it takes a good long time to get at all difficult — so long that I began to wonder if there was going to be any real challenge to it at all. It’s certainly not obvious from the rules that there could be. Even in the later stages, I find some levels much easier than the ones around them. I think there may be some sort of parity issue, so that I sometimes luck into making moves with the right parity, but I haven’t analyzed it that deeply yet. If there is, then the levels with movable blocks presumably require you to move them to spots that make the parity come out right. The second game I tried, Jasper’s Journey is a platformer about an elf rescuing a cat from a witch by throwing fruit at monsters. Or at least, picking up fruit replenishes your ammo. There’s a lot of collectibles scattered around, both fruit and treasure, the latter being spendable at the inns that appear once in each level. Now, I’ve only gotten three levels in, which is apparently still within the amount covered by the demo, so anything I say about the game’s general character may be dead wrong, but the parts I’ve seen have been made mostly of vast open spaces with lots of branching paths, including non-obvious ones that lead to more treasure and ammo. It reminds me of Sonic the Hedgehog in its expansiveness, but doesn’t emphasize speed or impose time limits. The emphasis is instead on exploration. When I found a passage leading to a large network of underground tunnels in level 2, I felt like I had made a discovery — even though it is in fact an unavoidable part of the main sequence through the level. Each level contains three golden orbs, their purpose unexplained by the in-game instructions. I think they unlock a bonus room between levels if you find them all, but their real purpose, their game-design purpose, is to give exploration a definite goal, and to let you know when you’ve explored enough. If you’ve got all three orbs, there probably isn’t anything left to find. 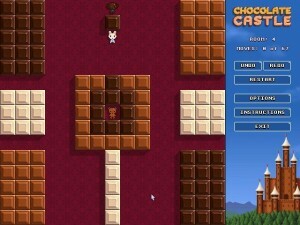 Finally, there’s Chocolate Castle, which is a series of sliding block puzzles. 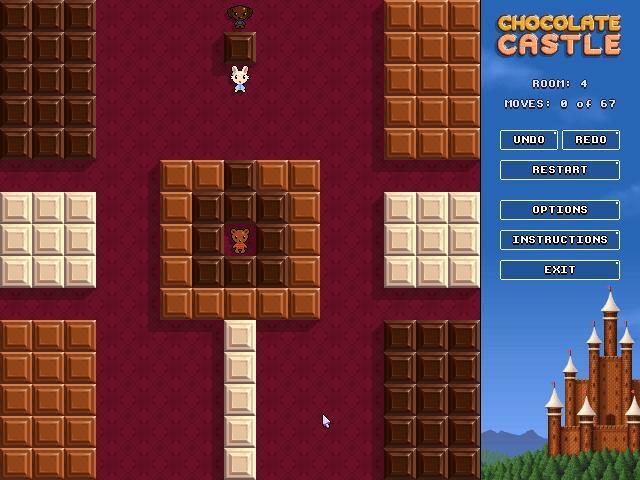 The basic idea is that the fluffy animals on each level have to completely eat the enormous blocks of confectionery lying around. Each animal only eats blocks that match it in color, and only eats a single contiguous set of blocks before vanishing. In most levels, there’s only one animal of each color, so you have to put all the blocks of that color together before allowing it to feed. But you have to be careful about this, because once you put similarly-colored blocks together, they fuse permanently. This is a pretty rich ruleset, allowing for a great deal of variation in the practical goals. One level might be something like a traditional klotski; another might fill most of the playfield with blocks of just one kind of chocolate, with so little free space that your main challenge is to avoid fusing them prematurely; another might immobilize two pieces of chocolate with walls, and make you figure out how to bridge the gap between them. 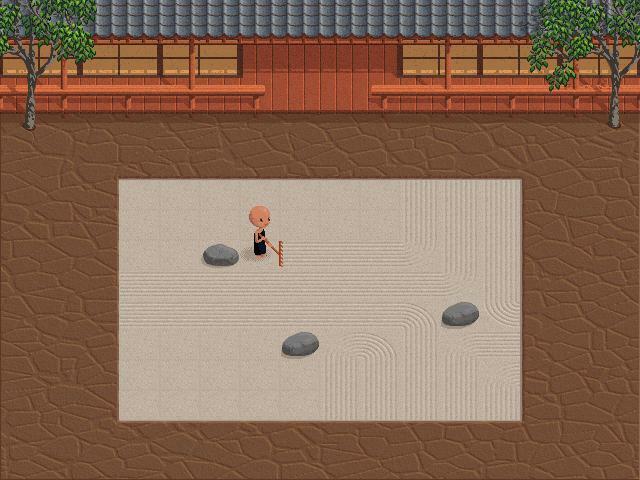 It makes for a much more appealing game than Zen Puzzle Garden, where the differences between levels are subtle and the goals are always the same. All three games have a graphical style that reminds me a lot of early VGA games, from back in the days when the graphic artists suddenly had 256 colors instead of 16 and hadn’t figured out yet what to do with them. I don’t mean it’s clumsy or amateurish, exactly, but there’s something about the flatness of the palette. Chocolate Castle definitely makes the best use of it: the smooth sheen just makes the chocolate more delicious-looking. It seems to me that indie games have reached a sort of turning point of inter-referentiality. In-jokey stuff abounds wherever nerds gather, but with Super Meat Boy, it escaped the confines of TIGSource and entered the marketplace. Blocks That Matter continues this trend: its story is indie-game-themed in the way that other games are fantasy-themed or mystery-themed or whatever. The premise is that its developers, a pair of wisecracking Swedes, have been kidnapped by someone who wants to play their latest game before its release. But they haven’t been working on a game, they’ve been working on a robot — a tiny cubical block-drilling-and-reassembly robot which is now their only hope for rescue. And so you puzzle-platform your way to your creators through indestructible tunnels littered with blocks in various materials, receiving instructions and banter by radio every couple of levels. 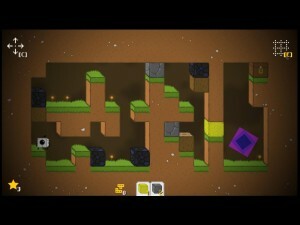 The chief inspirations for this game, according to the developers, are Boulderdash, Minecraft, and Tetris. And while I can see bits of all three — Boulderdash‘s falling rocks, Minecraft‘s dig-and-build mechanic — Tetris is the single most obvious source of inspiration. Your avatar is called “Tetrobot”, and has the ability to mine blocks and then place them elsewhere — but only four at a time, in a tetromino shape. Consequently, not only do you sometimes mine a block only to immediately reconstitute it elsewhere, sometimes you place a block only to immediately re-mine it, because you only needed to place it to fulfill the tetromino requirement. Also, at one point, you get an upgrade that lets you delete blocks in continuous horizontal rows of eight or more, Tetris-style. This and the block-placement limitation are handwaved as consequences of “Pajitnov physics”. There are several other upgrades to your abilities over the course of the game, but other than the one in the first level that grants you basic drilling ability, they’re mostly kind of disappointing. Like, you get the ability to collect metal blocks, which were previously undrillable, and shortly afterward, undrillable crystal blocks start appearing, which are in turn made drillable by another upgrade. There are several different block materials with different properties — sand blocks that fall when unsupported, flammable wood blocks, ice blocks that slide horizontally when you try to drill them — but most materials only differ cosmetically, at least by the end. Anyway, I do think it’s ultimately a good thing that the game makes some of the Blocks That Matter inaccessible until after further upgrades, because it gives the game an element of nonlinearity. If it had been possible to collect each on the first pass at a level, I would have done so, and then wouldn’t have anything to go back to when I was stuck. And yes, I did get stuck sometimes, for a while. 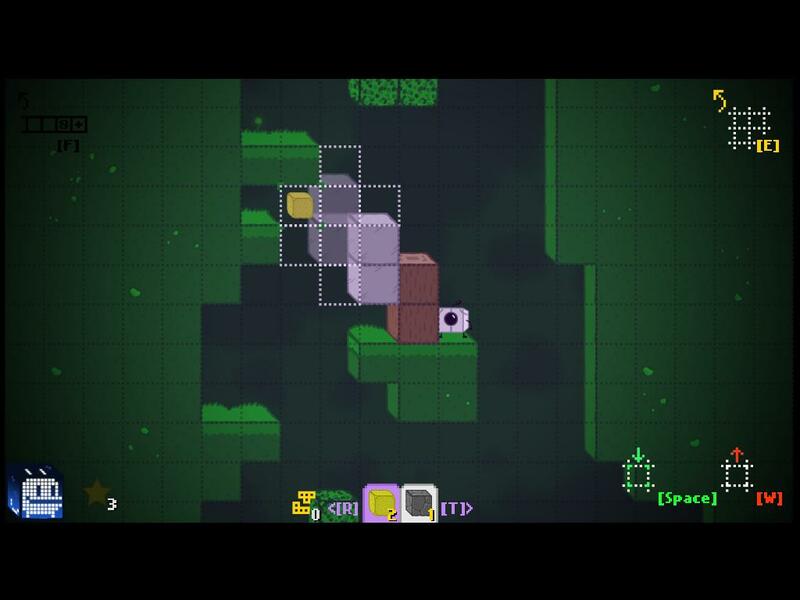 There are puzzles here that require special insights into the game mechanics, like how to place blocks in a useful way in a confined space. I think the one point I was stuck on the longest was one with a small pit lined with TNT blocks, which explode a few seconds after you try to drill them. It seemed like an impossible situation: the only way to clear the way was to detonate the blocks, which you could only do by jumping into the pit, from which there was no way to escape the explosion. But in fact there was a way. It just wasn’t the sort of thing you do in most of the rest of the game. 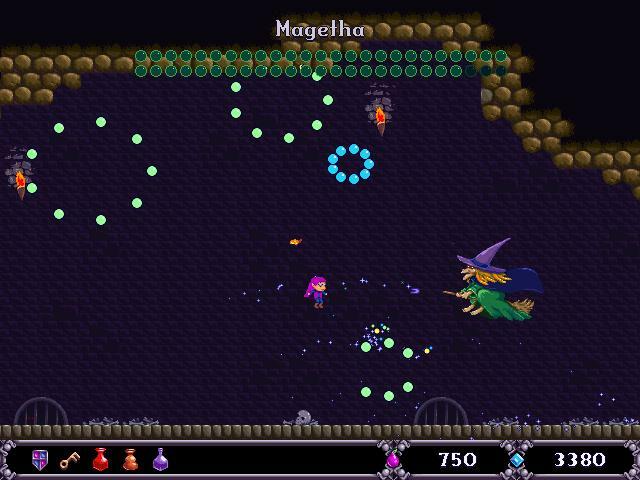 There are actiony bits, where you have to dodge moving elements like slimes or dripping lava, but it’s mostly sedate and self-paced. 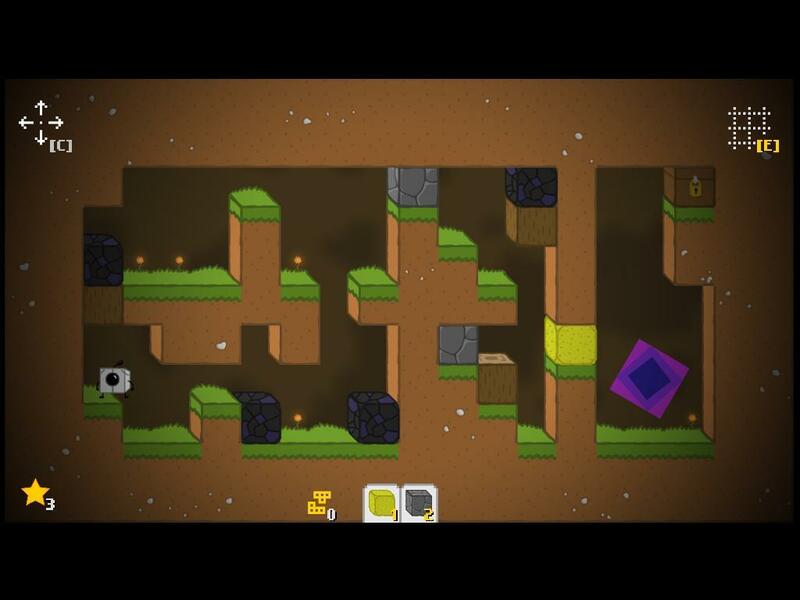 Even slimes can be destroyed without dodging by dropping sand blocks on them; even lava can be stoppered by putting a stone or metal block right underneath it. Placing a tetromino involves going into a special “edit mode”, in which time is frozen. Sometimes I went into edit mode just to pause the action while I assessed my situation, but even that was usually unnecessary. There’s a certain amount of busywork involved in just collecting blocks that will be useful elsewhere, and in some levels, where there are multiple stages of puzzle, I found myself repeating the earlier stages a lot because I was making mistakes or getting killed in the later stages. There are a variety of ways a game can avoid this — checkpoints, rewind functions, etc. — but the developers here didn’t implement any such things. I hope they consider adding them if they ever do a sequel. Nonetheless, I call this a pretty good game, well worth the fraction of the bundle money I spent on it, and the few hours it took me to reach the finish and get most of the Blocks That Matter. The few I haven’t got are in the more action-oriented levels, and will probably stay there, curious though I am about what games they reveal.